Safebreaking reached its height of success in the late 1970's. From then it has tapered down to the extent that it is now almost non-existant. It finished with a peak in 1980 when a 'supergrass' brought about the arrests and convictions of most of the criminals who had been wreaking havoc, mainly on jewellers safes, during the preceding fifteen years. From the records of the Central Criminal Courts in June 1981,Detective Inspector John Bassett of the Flying Squad said that "Toni Fiori had confessed to every crime he had ever been involved in and he had given evidence as a 'supergrass' against many of his accomplices". As the accompanying headlines indicate, the total losses could have reached £1.36m. In a previous section reference was made to the fact that in the 1950's intruder alarms were still in their infancy and that the safe was in fact really the last line of defence. As the systems became more sophisticated with manned central stations and improved reliability, some insurers placed an over-reliance on the electronics to the detriment of the physical protection. As the above headlines also show, the electronic protection proved to be virtually useless. Alarm experts, security company employees, GPO engineers, all figure in the list of 19 accused brought before the Court. It was then all down to the safes, which it must be said, would have stood a better chance had they been anchored. As it was, the gang, which often comprised five members, had the equipment and ability to move 30 cwt. safes to areas where they were not overlooked by other buildings and where the flash of burners and noise of electric hammers would not lead to their detection. The key figure in this was of course Fiori. It would seem that he was both thorough and highly skilled in all the forms of safebreaking techniques from drilling to oxy-acetylene cutting. As an example of his thoroughness, among the many police productions held for the court was a Petrogen® cutting set. This poweful oxy-fuel to rch has many legitimate applications and it transpired that Fiori had even gone to the length of evaluating its potential before deciding against it in favour of the tried and trusted oxy-acetylene. The gang was also familiar with the thermic lance which was used to effect in the successful attack on an anti-blowpipe safe at Intogold in Edmonton in August 1978. Then in March 1979 as reported in the Barnet Press - "Raiders at Waitrose Supermarket, Whetstone, burnt their way through a security safe before making off with (or destroying) more than £30,000. Using a thermic lance, the men burned several thousand banknotes in the safe in their efforts to gain access." They left one acetylene and five large oxygen cylinders behind. 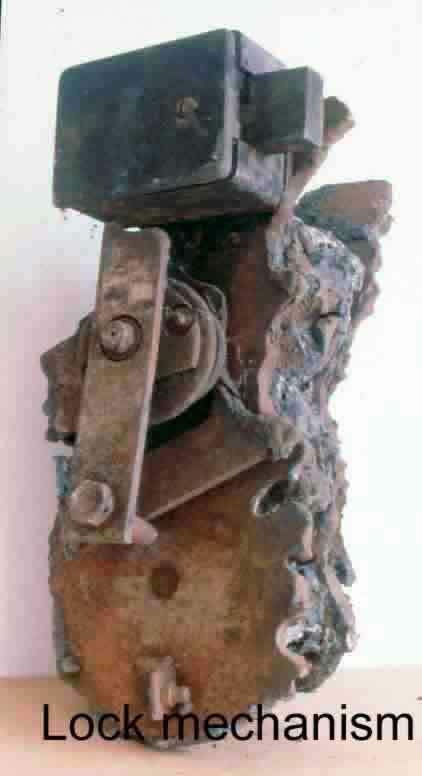 The photograph shows the section of mechanism removed to allow the door to be opened. The skill and knowledge of the criminals was of the highest order. The skills went beyond the application of the tools. They knew exactly what make and type of safe they were up against, Fiori actually quoting on one occasion, " yes, it was a Mark 7 Bankers". It was obvious that they gained detailed knowledge of the specifications of the safes they were about to attack. Rumours circulating at the time alleged that a certain London secondhand safe dealer was not averse to providing assistance in this area. 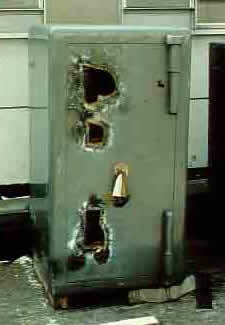 As an example, this photograph below of a Ratner heavy cash safe where each of the penetrations corresponds exactly with the vital locking points of each keylock, plus one at the top to release the anti- explosive relocker which had been activated by the heat. Fiori's last job before his arrest was at Attenboroughs Jewellers, Bethnal Green Road, London. He had persuaded a Post Office engineer to neutralise the central station alarm before starting on the first of four safes on the Saturday night, but had to return on the following evening with an electric hammer. 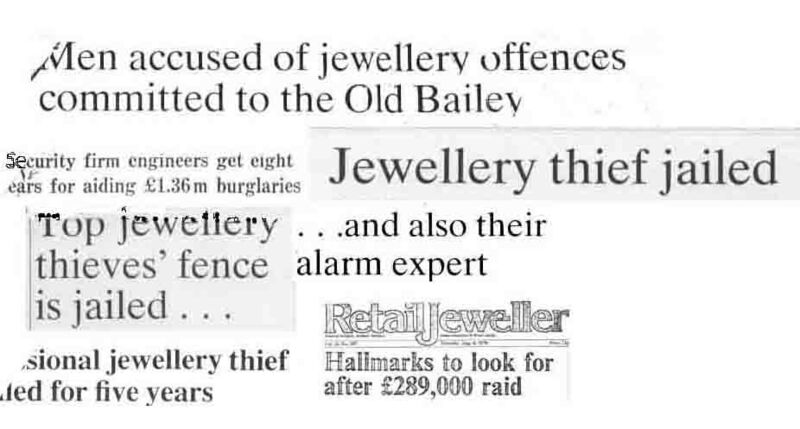 Three of the four safes were opened from which jewellery worth £64,000 was stolen. Fiori was given a nominal sentence of five years imprisonment. While awaiting sentence for admitted robberies totalling £7m, another member of the gang, Michael Gervaise shared accommodation with Fiori at a 'secret location' in North London. Gervaise was a lockman of whom it was said had the ability to exchange the main door lock on potential target premises with an exact replacement, which, while still appearing to function properly when used by the staff, was under his control. This exchange was apparently executed in less than a minute without suspicion and of course would enable subsequent access through the outer door without obvious damage at any time. One of the last attacks conducted by the gang was on Triefus & Company in Holborn Circus on the weekend of 12th -13th October 1978. The alarm system was again overcome but on this occasion the safe was of the highest quality and the attack proved fruitless. A contributory factor may have been poor equipment or lack of skill on the part of the operator of the oxy-acetylene cutter as the tell-tale soot marks of incorrect gas mixtures around the cuts on the safe indicated. This seems a logical point to bring the story of safebreaking to an end. There have doubtless been many attacks since but few have come to public notice, save perhaps the removal of several ATMs from glass fronted premises by use of heavy contractor's plant. Reference was made earlier to the Victorian practice of safemakers using tests, testimonials, and challenges to hopefully satisfy the end user that their product was capable of fulfilling its eventual purpose - that of withstanding any attacks to which it might be subjected for as long a time as it be left unattended. This century it fell to the insurers to specify the safe they felt most appropriate for the risk. Within the last decade all safes intended for the protection of valuables are required to obtain a burglary certification under European Standards as has been the practice on the continent for some years and for a considerable time in the United States through the Underwriter's Laboratories. The system is not perfect - safe testing is a very subjective matter - but at least it creates a level playing field for manufacturers.